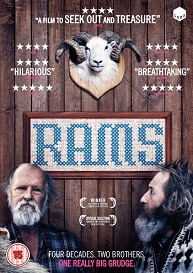 RAMS is out on DVD on the 30th May, and to celebrate we have a great competition for you and 3 copies on DVD to give away! In a secluded valley in Iceland, brothers Gummi and Kiddi live side by side, tending to their prized ancestral sheep. But a long-term grudge means that they haven’t spoken to each other for four decades, passing messages via the sheep dog. When a lethal ovine disease suddenly appears in the valley, the authorities move in to cull all of the livestock. But Gummi and Kiddi don’t give up easily and each brother tries to stave off the disaster in his own fashion: Kiddi by using his rifle and Gummi by using his wits. As the authorities close in the brothers will need to come together to save the special breed of sheep passed down for generations - and themselves - from extinction.